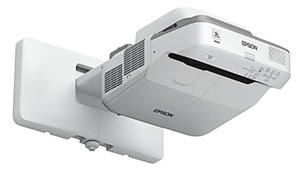 Epson today announced a new ultra-short-throw projector designed to work with Smart Technologies' Smart Board M680 and 880 interactive whiteboards. The PowerLite 680 for Smart is a 3LCD presentation display offering XGA resolution, 3,500 lumens of color and white brightness and projection of a 77-inch image from a distance of less than 7 inches — all with seamless integration with Smart Extended Control Panel, according to a news release. Representatives from both companies emphasized the projector as a way to boost display performance for the Smart Boards: "Epson's PowerLite 680 for Smart was designed specifically for use with Smart Board M680 and 880 interactive whiteboards to deliver educators and students with immersive collaborative experiences utilizing the display's superior brightness," explained Veronika Knight, product manager for projectors at Epson America, in a statement. "The new Epson PowerLite 680 for Smart provides our customers with the option to maintain an integrated Smart interactive whiteboard system with enhanced display performance," added Tom Ferrari, director, channel, for Smart Technologies. Available Message Broadcasting plug-in for EasyMP Monitor, which can send updates or announcements remotely to up to 1,024 Epson networked displays. MSRP for the PowerLite 680 for Smart is $1,160. Special education pricing and extended warranty coverage is available through Epson's Brighter Futures program. For more information, visit the Epson site.